I am happy to report that I can now sell many of my recordings direct from this website! 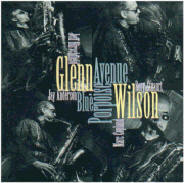 Many of these recordings (and others) are also available directly from the record companies, from record stores with good jazz selections, and from Cadence. You can hear a few excerpts at www.myspace.com/rorystuartquartet. 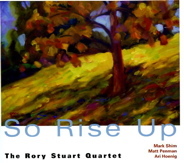 The Rory Stuart Quartet — "So Rise Up" (SmartCatMusic 1001) w/ Mark Shim, Matt Penman, Ari Hoenig. I am so excited to be able to offer my newest recording, which best represents the music I'm playing today, with my current quartet. This is too new to have any reviews yet, but it gets my highest recommendation! 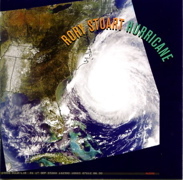 The Rory Stuart Quartet —"Hurricane" (Sunnyside Communications SSC 1021) w/ Keith Copeland, Anthony Cox, Armen Donelian. You may have seen the old version floating around, but I recommend the recently reissued version in which Sunnyside included both the original liner notes (that were supposed to be included originally) as well as new liner notes and artwork. This is only available on LP. That's right, ONLY ON VINYL. Somewhat of a collector's item, but then not too many people collect vinyl these days. I do not have a full picture of the cover to put here but, when he saw the cover, McCoy Tyner said to me "You've got to try to control what the record companies do with your work!" Still, in spite of having one of the world's worst LP covers, Cadence Jazz Records had the courage to release my debut recording and the critics loved it. Thank you, Cadence Jazz Records! ONLY ORDER THIS IF YOU REALLY WANT THE VINYL RECORD - it is NOT a compact disc!!! 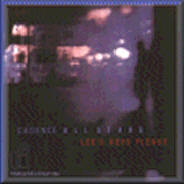 The Cadence All Stars — "Lee's Keys Please" (Timeless SJP 284) w/ Glenn Wilson, Ernie Krivda, Alan Simon, Jeff Halsey, Jon Hazilla — This was a session put together with different leaders who had recorded for the Cadence Jazz Records label. You have to see the incoherent job Timeless did with packaging and notes to believe it; BUT, it has some nice things musically that have stood the test of time. Timeless REALLY dropped the ball on this, it must be the most difficult-to-find recording I've ever done. Now, it is truly a collector's item. I have been able to find just a few remaining copies - I believe the other co-leaders of this recording have none left - we can't get any more from Timeless - when these are gone, that's it. Apologies that I have so few copies, and that the price is as high as it is (though it might turn out to be a good investment!). 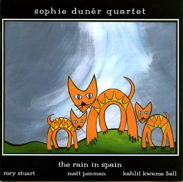 The other is a recent recording on the CIMP label with Swedish vocalist Sophie Duner and a very enjoyable rhythm section with Matt Penman and Kahlil Kwame Bell. Sophie does some of her quirky original pieces - some you might not label as "jazz" (I'm not sure *what* you'd call them! ), but it has that spontaneity and excitement of a live recording, fun. The Errol Parker Tentet — "Live at Wollman Auditorium" (Sahara Records 1014) w/ Wallace Roney, Steve Coleman, Doug Harris, Bill Saxton, Robin Eubanks, Patience Higgins, Kevin Harris. The Francis Vanek Quartet — "Redwood Range" (title tune) (Valentine 1952) w/ Geoff Lee, Phil Sparks, Chris Lee. 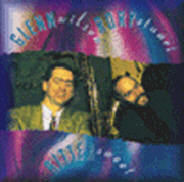 I have performed at the Kool Jazz Festival, and jazz festivals in Ottawa, Vancouver, Burlington Vt., Saalfelden Austria, Telluride Co., at the Painted Bride Arts Center in Philadelphia, Fat Tuesday's, Lush Life, Cornelia Street Cafe, and the Blue Note in New York, and at a myriad of other clubs and concert spaces in and out of the U.S. In the past few years, I have performed in Schwaaz, Austria; Langnau, Bern, Basel, and Lausanne, Switzerland; Aarhus, Denmark; Bassano, Italy; Reykjavik, Iceland; Seoul Korea; etc....(I will add more detailed information about performances soon). Recent and memorable performances have included concerts in Europe with Billy Harper and Cecil Bridgewater, a performance in Korea with Jason Lindner, Billy Harper, Gregory Jones and Ari Hoenig; a Jazz Presents concert at New School University in a group I led with John Ellis, Robert Glasper, Matt Penman, Dafnis Prieto, Jean Rohe and Becca Stevens, and another I led with Billy Harper, Francesca Tanksley, Reggie Workman, and Ari Hoenig; and nights at Cornelia Street Cafe with versions of my Quartet with saxophonists Mark Shim, Glenn Wilson, or George Garzone; bassists Matt Penman, Francois Moutin, John Lockwood or Chris Tordini; and drummers Ari Hoenig, John Riley or Dafnis Prieto. Please note: I am very happy for others to play my compositions. I especially enjoy it when people put their own spin on the music and surprise me with what they have done with it. I have too many pieces to put everything up on this site, but please email me if there is a piece for which you want music that I have not yet posted. My one request is that you let me know about your performances and recordings of this music.